Today I spent some time with Scott, my technical support person for my blog ... he is a friend of my son, Jeremy ... and has spent several hours helping me to set up my website ... and then set up my blog. I so appreciate his help. Thank you Scott!!! Today he showed me a few new ways to improve my blog, so I'll be working on that over the next few months. Today's CAS challenge is a color challenge (CAS168 - chocolate, green and white or ivory). This is such a classic color combination and I had lots of ideas for cards, but settled on one using my owl punch from SU! Hope you like. I started with the owl. I punched him out with Early Espresso and Whisper White cardstocks and punched out the vest with the Wild Wasabi polka-dot DP from Just Add Cake DP. I punched out an extra owl body and cut out one of the "feet" to be used for an arm and hand to hold the bouquet. I glued all the parts together and glued the tip of the arm to the back of the owl's body. Next I ran the Wildflower Patch die-cut through my Big Shot with both Wild Wasabi cardstock and Whisper White cardstock. I cut the heads of three of the white flowers and glued them on top of the matching green flowers with stems. I cut off three small heads from green flowers and used my mat pack and stylus to shape the flower heads into a cup shape. I glued these to the center of my three flowers. I used the white gel pen to add a dot in the very center of each flower. I gathered the flowers together and tied a bow around them using Early Espresso twine. I added a 1" strip of Wild Wasabi polka-dot DP to the top of my Whisper White card front. I wrapped more Early Espresso twine around and tied a bow and then used sticky strips to mount the card front onto a card base of Early Espresso (for stability). I stamped the sentiment in Early Espresso ink and then mounted the owl just above, popping it up with dimensionals to add depth. I added three rolled up glue dots to the bouquet (one behind the bow, and one on each of the back two flowers) and then secured the bouquet to the owl's "hand". 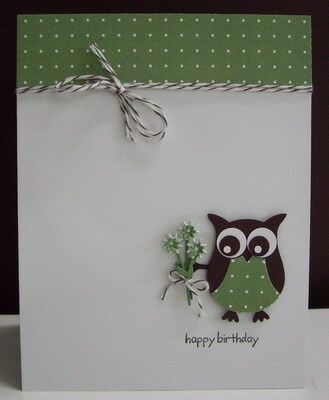 For the inside of the card, I added a 1" strip of Wild Wasabi polka-dot DP to the top of a Whisper White card panel. Today I'm adding a new recipe to the "Baking" tab of this blog. 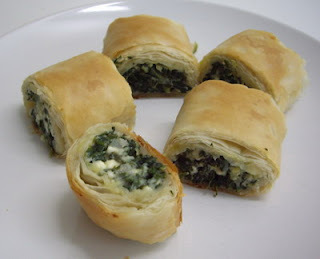 I usually only add sweet treats, but I posted a picture of the Spanakopita Rolls that I made the other day and had a request from Marcia to include the recipe. This is for your Marcia!! Hope you have fun making these for your church tea! Labels: birthday, CAS, poppy stamps, Stampin' Up! Thanks so much Loll! Can't wait to give them a try! Loll, this immediately made me smile and I needed that today! Thanks for sharing this card. so cute Loll! love it! Thank you so much for your awesome details on how you put it all together. Such a cute card!